NTUC Run 350 2014 Review: We Ran (10km) for a better tomorrow | JustRunLah! We ran for a better tomorrow! I had registered for the Half Marathon category, and arrived on site at around 5:00am (flag-off was scheduled for 5:30am). It was a bit cloudy but little did I know how much the weather was about to change. It started drizzling at around 5:15am and by 5:30am, a full-on thunderstorm was on. Everybody sought for cover under the canopy tents or in the F1 Building. The rain was so heavy that even though I was standing under a ledge, I somehow managed to get soaked. A first announcement for delaying the flag-off right came on the speakers right away. 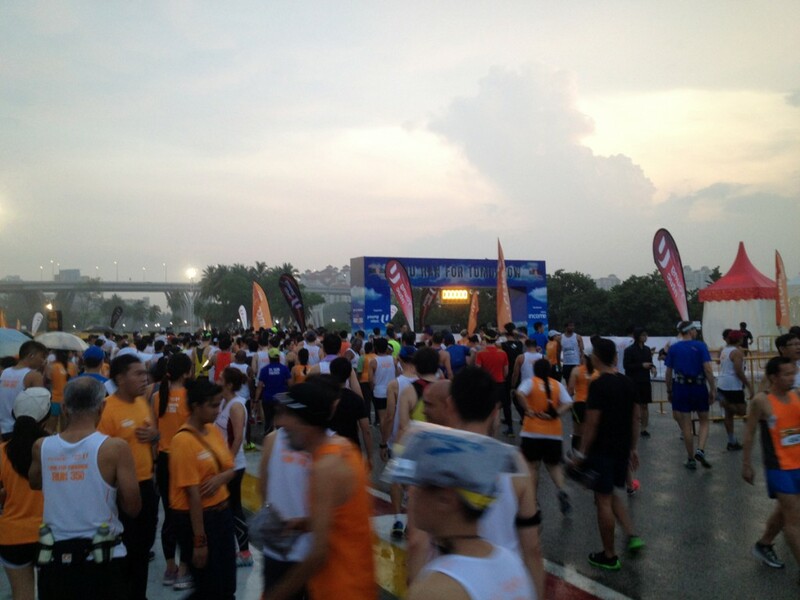 The rain and thunder were going strong, so at around 6:15am the cancellation of the Half Marathon was announced. The fate of the 10km would be announced later. 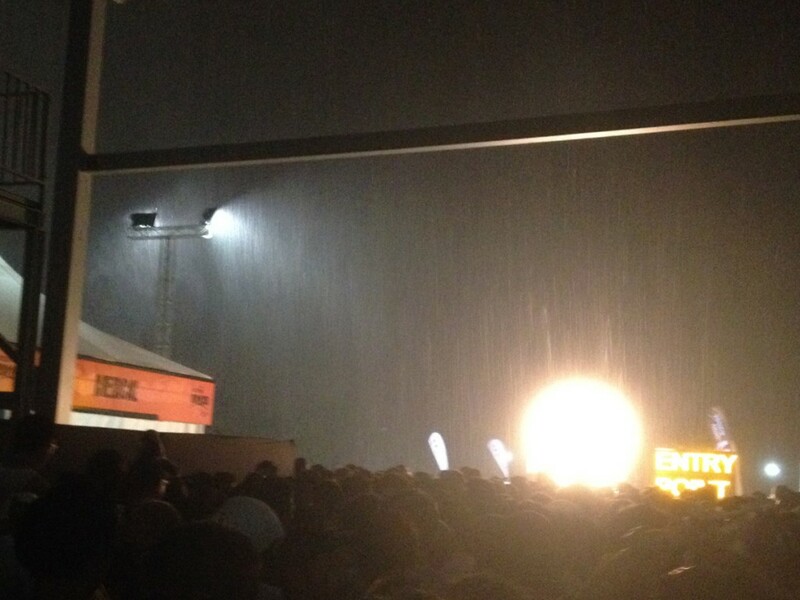 Heavy rain and thunders lead to cancellation of the 21km race. As promised by the organiser (they did an excellent job updating us on time) the decision for the 10km was announced at around 6:45am. And luckily it was a “GO”! 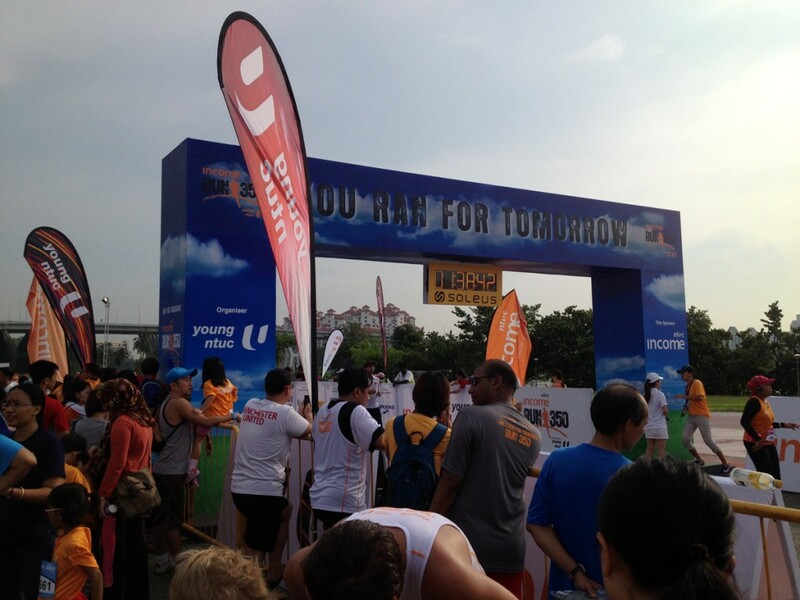 What’s more, 21km runners were welcome to join the 10km race – as a “fun run” however, that is, without official timing. Everybody was happy that the wait was over and the rain didn’t manage to ruin our run completely. We all entered the pen for a 7:15am flag off. Soon enough, the race was on. After the first few kilometres, we exited Republic Avenue and turned to Nicoll Highway. The loop was closed via Kallang Road. 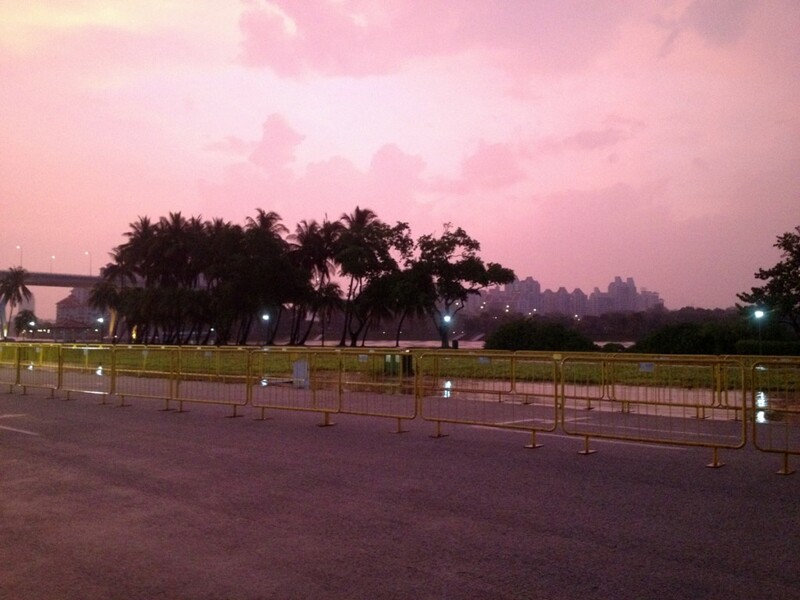 It was a very comfortable run in the after-rain breeze, and the red-coloured sky gave a unique look to the landmarks along the route. There were plenty of hydration points (I think I counted 5 or 6) offering both water and 100Plus, as well as WCs placed along the route. Despite the huge number of runners (which must have doubled due to the 21km runners ending up joining the 10km), I did not come across any bottlenecks or congestion along the race. 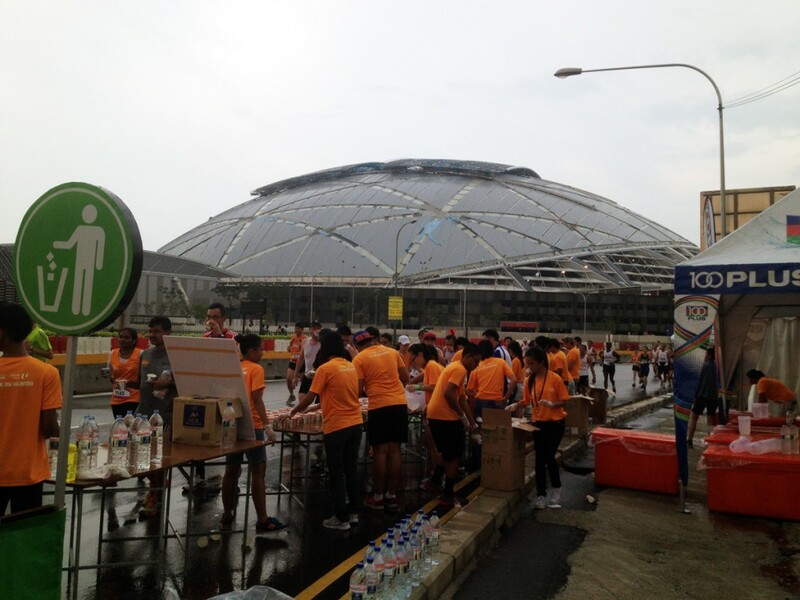 Massage, food and drinks were available at the finishing line. 10km race is ON and all are welcome to join! As recorded with my Sports-Tracker app. – Cancelling such a big-scale event is not an easy business, yet I believe that the execution was perfect. There were timely updates via internet and sms and all staff werewell-informed and helpful. – The 10km route was planned very well, and it accommodated the increased number of runners without any problems. – Volunteers did an amazing job, I saw many of them helping people get cover from the rain by taking them under their umbrellas. 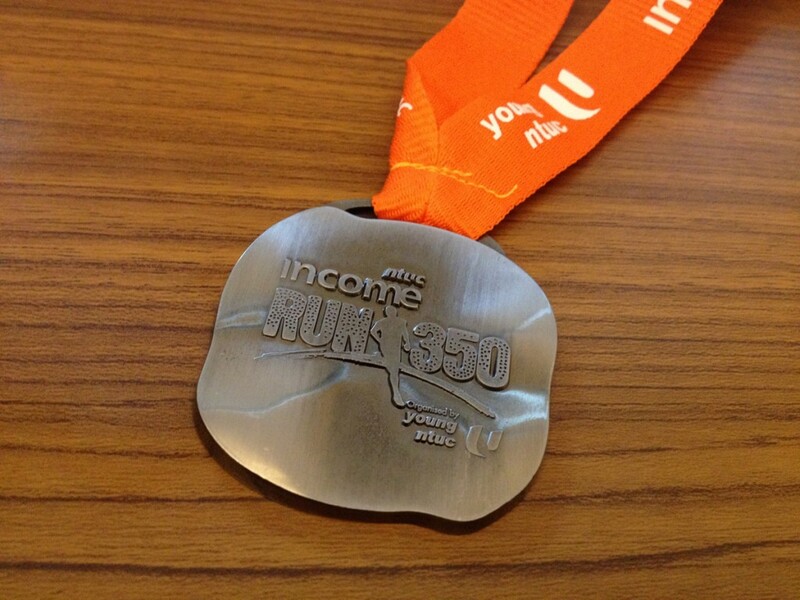 Finisher medal, made partly from recycled material. – Post-race makan. Unless there was a tent I missed (let me know in the comments section), we were only given bananas after the race. 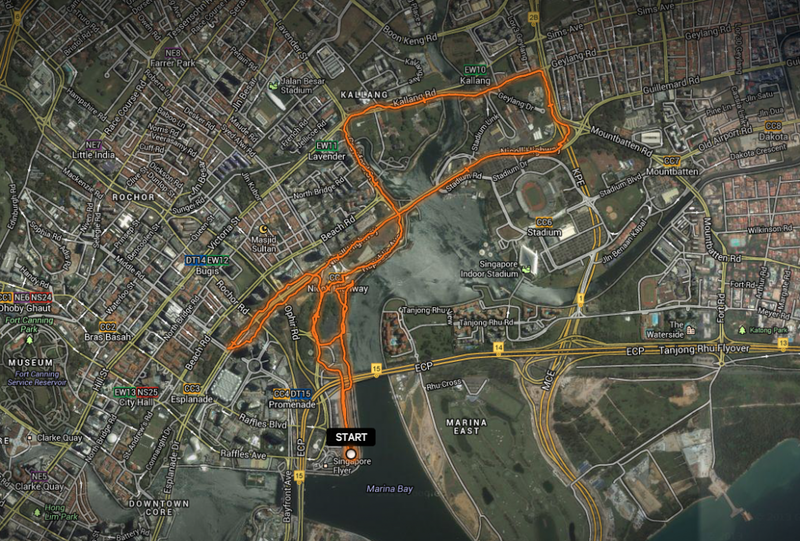 – Perhaps the organiser pulled the plug on the 21km race a bit too soon. From my perspective as a runner, it could have been flagged-off at 7:00am. I suppose there were good reasons (road closure and logistics) behind their decision though. At least official updates were coming on time. I am generally against cancellations due to weather conditions, but there is absolutely no way the race could have been carried out as planned today. All in all – and I believe that most of the runners out there will agree – it turned out to be a very enjoyable 10km “fun run”. Despite the cancellation of the 21km category there was positive energy and smiles all around. Congratulations to the organisers for pulling this off, given the tough conditions. 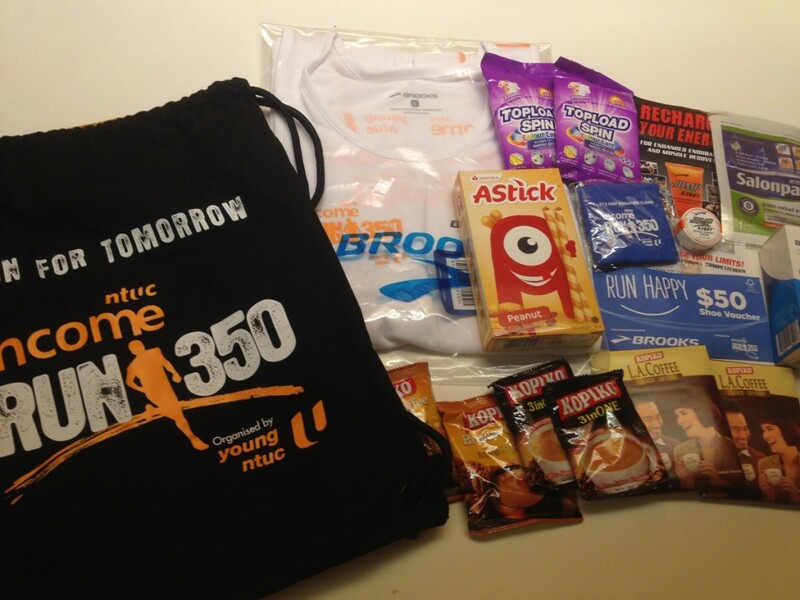 I am looking forward to next year’s NTUC Run 350. The generous race pack with lots of coffee! 1) Post-race makan. There are only a few races known for their post-race makan; and Run350 is not one of them. Most races (not all) will give banana so be thankful for that. 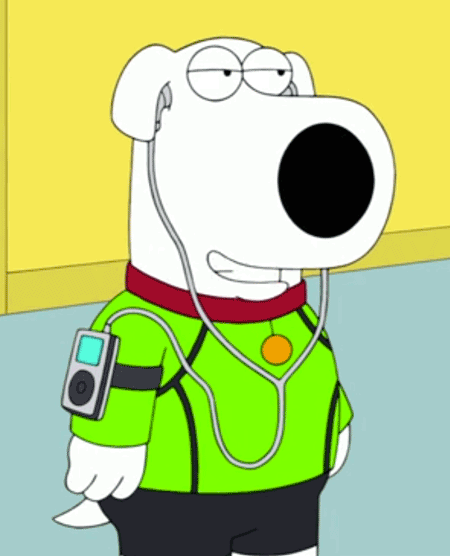 2) Pulling the plug on the 21K too soon. Its unavoidable. There is a limit to how much they can delay the race because of the road closure arrangement. 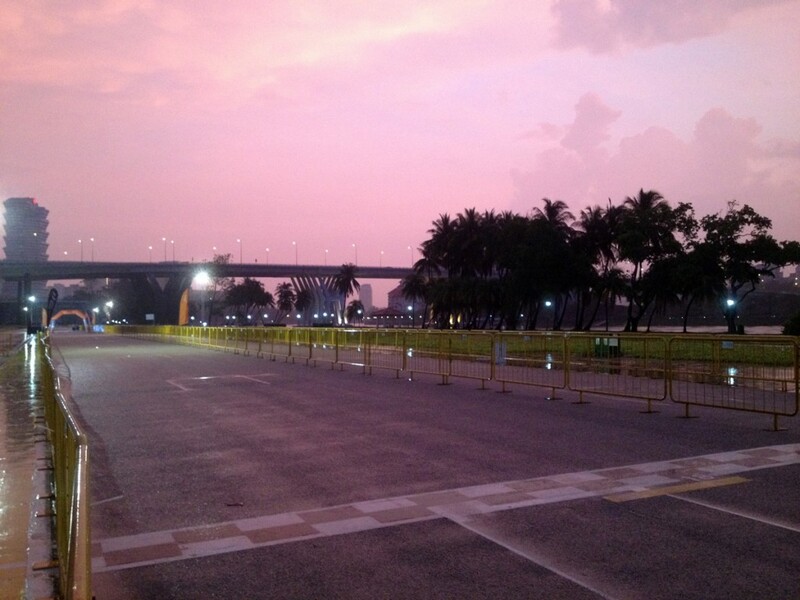 For this race, most had be to reopened by 9am. And with a 4.5 hrs cut off, delaying the race further will make it impossible for the slower runners to complete the race. Also while it may be clear where we were, other part of the race may still be Cat 1 weather. I dun think they can delay the race much further than 6.30am which is why the announcement was made at 6.15 when its obvious the weather will not cleared up by then.